This RV trip took us into far- West Texas to explore areas around the Davis Mountains, "Where the stars come out to play". Kay was born and raised in West Texas so she is familiar with this area from visits during her childhood, but it has been a few years since she were last there. Lawson visited there once with Kay and her mother many years ago, but has always looked forward to a longer visit. The time was finally right. We left Richmond on Monday morning, March 13th, via IH-10 west. Heading into a strong crosswind, we made good time regardless of the wind. We ate lunch at a new roadside rest area east of San Antonio. We bypassed San Antonio via Loop-1604 and then back onto IH-10. We arrived at Pecan Valley RV Park about 8 miles west of Junction around 5PM. We have stayed at this park before and like it's remoteness. It is next to a large Pecan orchard with many deer roaming through the area. Tuesday we returned to IH-10 west and continued through the westward limits of the Hill Country. We took a detour off IH-10 at Sonora, county seat of Sutton County, for a very interesting introduction to the town from a friendly lady at the Mier's Home Museum. 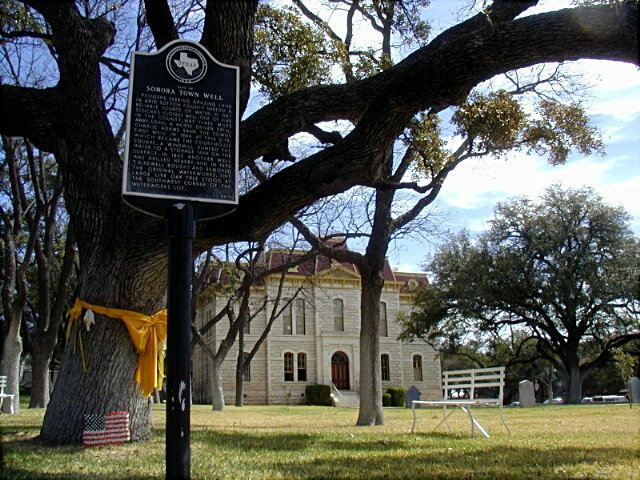 The Courthouse was designed by renowned Texas architect, Oscar Ruffini of San Angelo and construction started in 1891. It was in process of restoration inside, so we couldn't go inside. We looked around an old house across from the courthouse that was for sale. We spent several hours walking around town using the Walking Tour guide. We noted Sonora as a place worthy of further investigation in the future. < Sutton County Courthouse, c1890's. We continued west on IH-10, arriving at Parkview RV Park in Fort Stockton in late-afternoon. The wind was still blowing strongly from the southwest and during the night it kept rocking the trailer with gusts of possibly 35 to 40 mph - made for good sleeping. Wednesday morning we went to the Ft. Stockton Chamber of Commerce at the old train depot and picked up tourist information. In the afternoon, we visited the Annie Riggs Memorial Museum, located in the old Koehler Hotel (c.1901), and learned some of the colorful history of Fort Stockton. We also visited the Grey Mule Saloon (Visitor's Center), and walked through the Pecos County Courthouse. We took the driving tour of the historic district, stopping at the oldest house in Fort Stockton (c.1859), Koehler's Store and Comanche Springs. Unfortunately, we learned that the springs dried up many years ago due to farm irrigation. < Annie Riggs Memorial Museum. Thursday morning we visited Historic Fort Stockton. The fort was originally constructed in 1858 and manned by black soldiers of the 9th Cavalry. 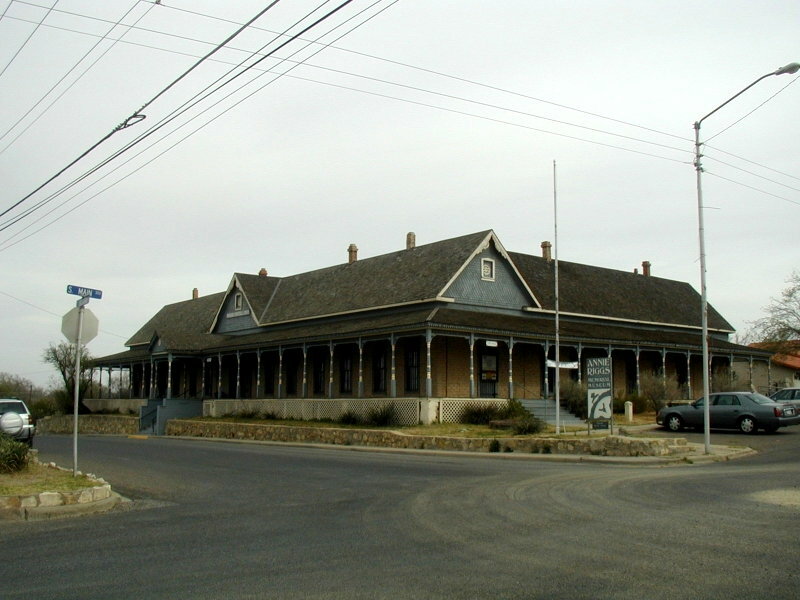 It was abandoned during the Civil War, but re-activated in 1867 and stayed in operation until 1886 to guard westward travelers from the Comanche Indians. A few of the old buildings remain, but most of the buildings there now have been reconstructed. < Historic Fort Stockton Officers Housing. After lunch we drove around the historic district again, visited the library to check email and did some shopping. 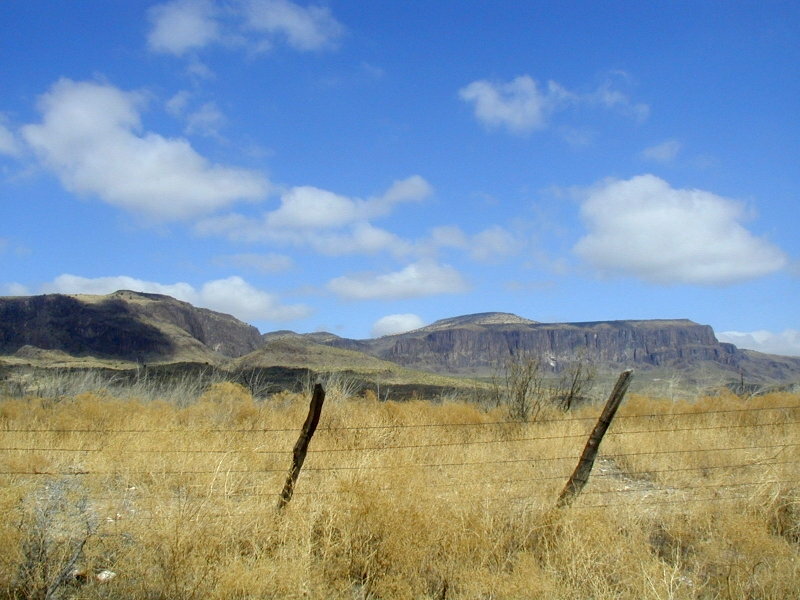 Friday we left Fort Stockton on I-10 west for the short drive to Balmorhea State Park. We arrived in time to eat lunch at our campsite. In the afternoon we walked around the park. The weather was cool, overcast and gloomy, but no rain. We were able to do some birding. < Our campsite at Balmorhea State Park. Saturday we spent the day reading and walking around the park, but the weather was still dreary with some rain showers to keep us inside most of the time. Sunday morning the weather was still overcast and threatening to rain as we wrapped up our stay by a little more bird watching. After lunch we took the short drive south on TX-17 to Fort Davis, arriving at Davis Mountains State Park in the late afternoon. A cold front came through shortly after we arrived at Davis Mountains State Park and blew out most of the clouds. Monday was a very Windy Day! The wind was blowing 40-55 mph continuously with gust to who knows what!! It was like that all day, so outdoor activities were restricted. We took the opportunity to drive along Skyline Drive in the park, photographing the great views of Indian Lodge and McDonald Observatory. 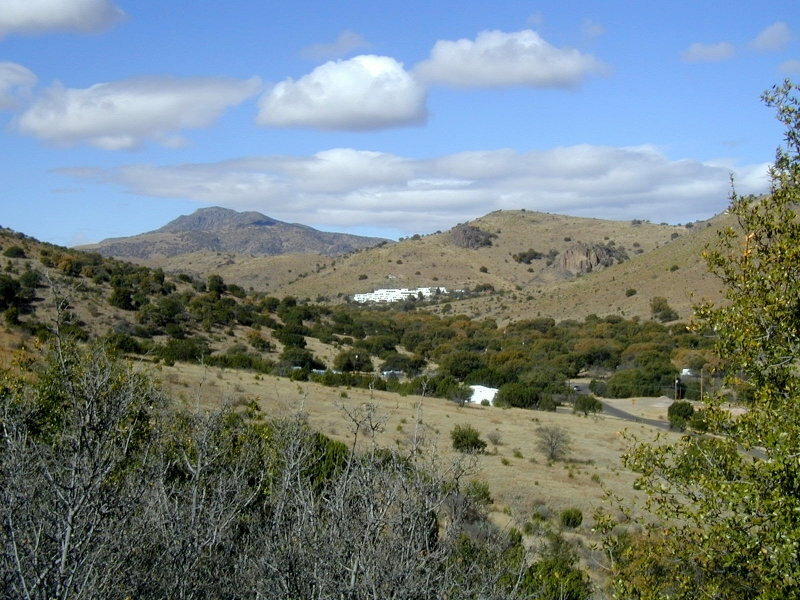 < View of McDonald Observatory & the Davis Mountains from Skyline Drive in the park. 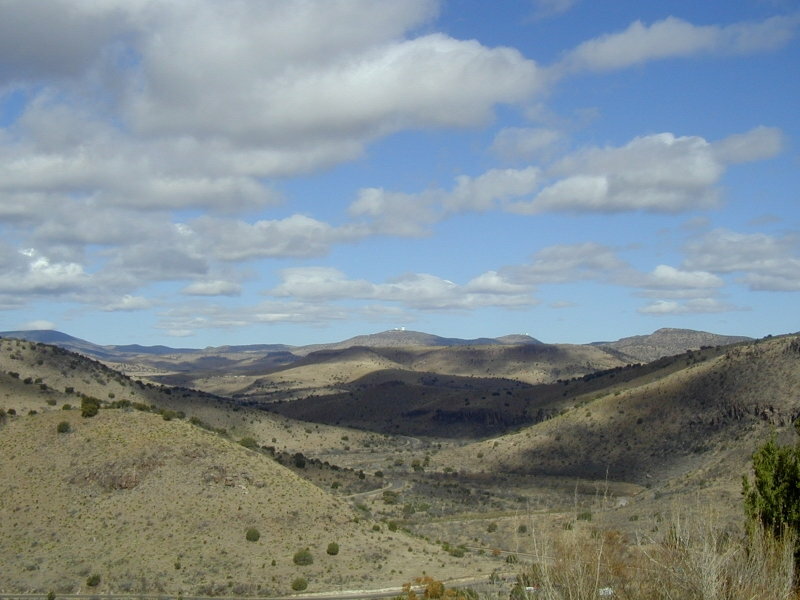 < View of the Davis Mountains from Skyline Drive in the park. 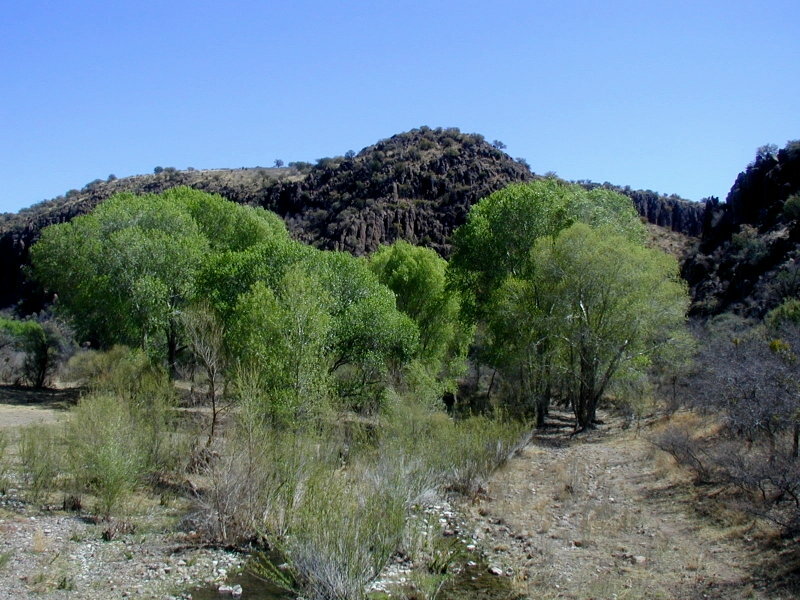 We then drove up TX-17 to Wild Rose Pass, photographing the cottonwood trees along the mountain stream. < Cottonwood trees along TX-17. Afterwards, in the afternoon, we drove the TX-166/TX-118 scenic loop. 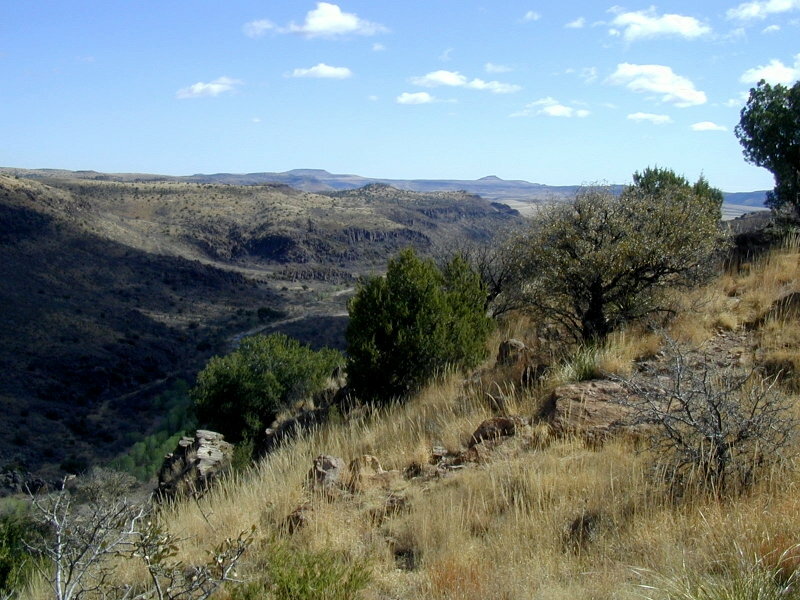 This is a "must see" 76-mile loop if you visit the Davis Mountains. 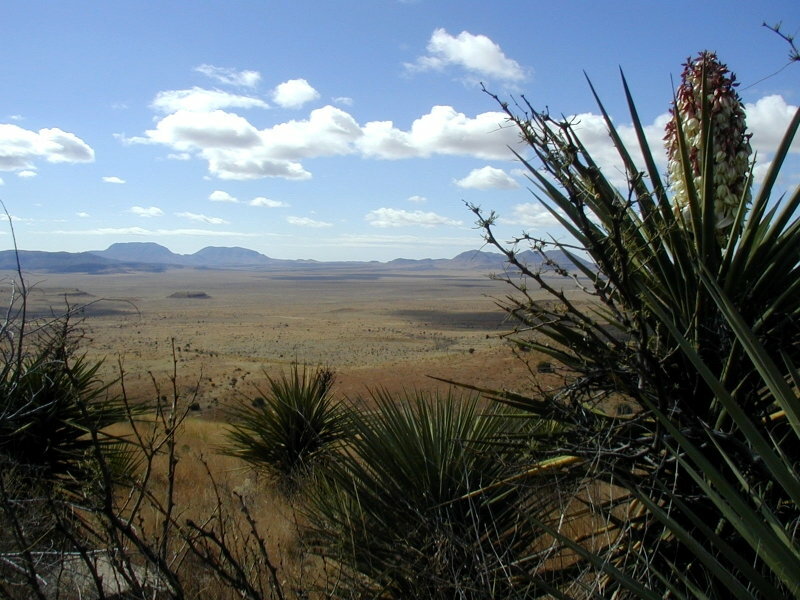 There were many scenic views of Sawtooth Mountain and Mount Livermore (the second highest in TX). On the way back to the park, we detoured to see the Radio Telescope that is a part of The Very Long Baseline Array (VLBA). It is one of ten antennas that spread across the US to allow astronomers to make detail studies of the sky. 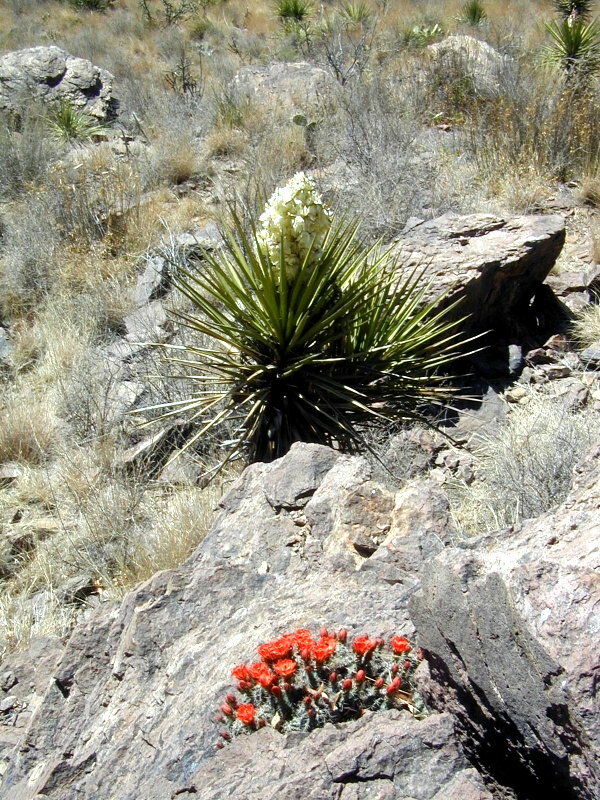 < Sawtooth Mountain (7,746 ft.) from TX-166. 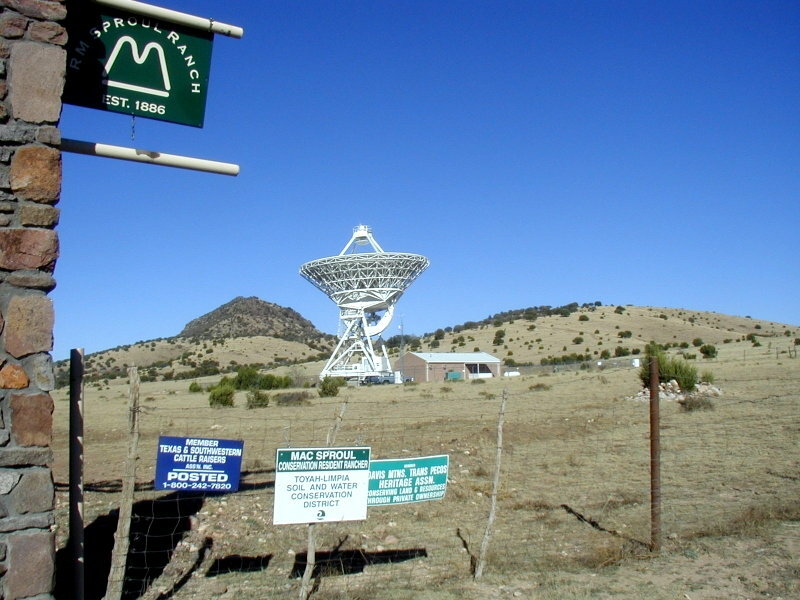 < A Radio Telescope that is part of The Very Long Baseline Array (VLBA). Tuesday morning we hiked about 1 mile along a trail that winds up the side of the mountain from the park entrance. Great views of McDonalds Observatory and Indian Lodge were possible at the top. < Indian Lodge from the hiking trail. 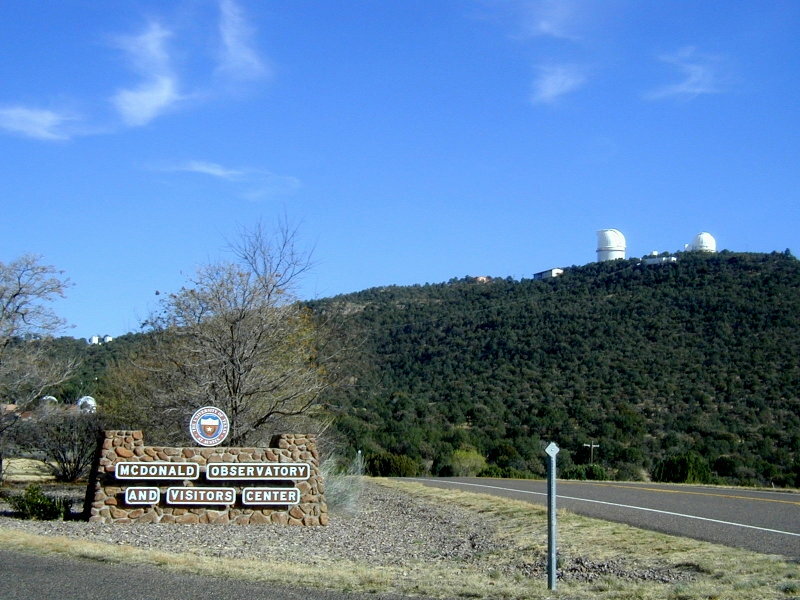 After the hike, we drove up to the McDonald Observatory and ate lunch with one of the managers at the HET telescope that Lawson met on the 2-meter Amateur Radio repeater the day before. After a nice chat with him, we attended the viewing of the sun using telescopes at the Visitor's Center. Afterwards, we took a guided tour of the 107-inch telescope and the HET telescope. After the tours, we drove back to the park and ate dinner at the Black Bear Restaurant located at the Indian Lodge in the park. After dinner, we drove back up to the observatory for the Star Party that night. After viewing a program in the theater, we were able to look through 5 smaller telescopes at the Visitor's Center. We saw Saturn, it's rings and it's moon Titan. We saw the Crab Nebula, Seven Sisters and another double star-cluster. It was good viewing after some high clouds threatened to spoil the show. It was really cold up there with the wind blowing strongly and temperatures in the low 40's. 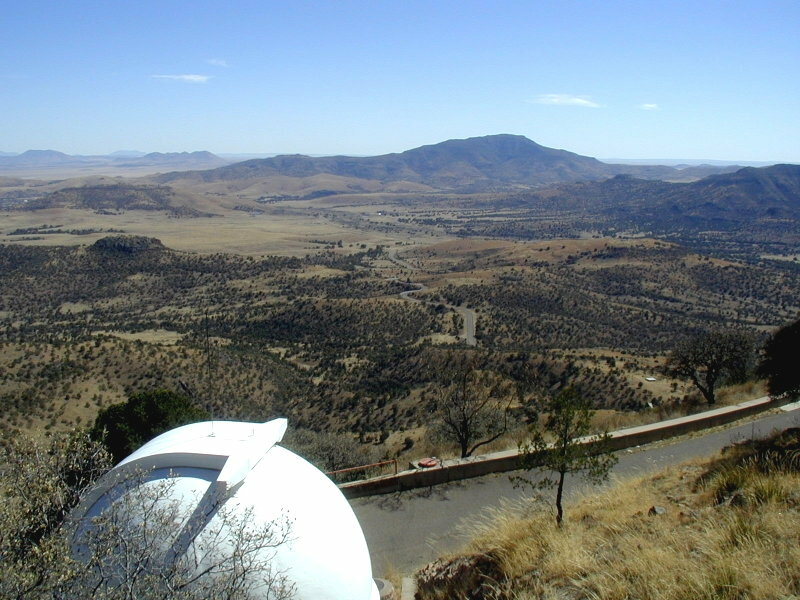 < The view from McDonald Observatory. Wednesday we took a hike up another mountain trail near the campground. After lunch, we drove into Fort Davis and toured the Fort Davis National Historic Park. 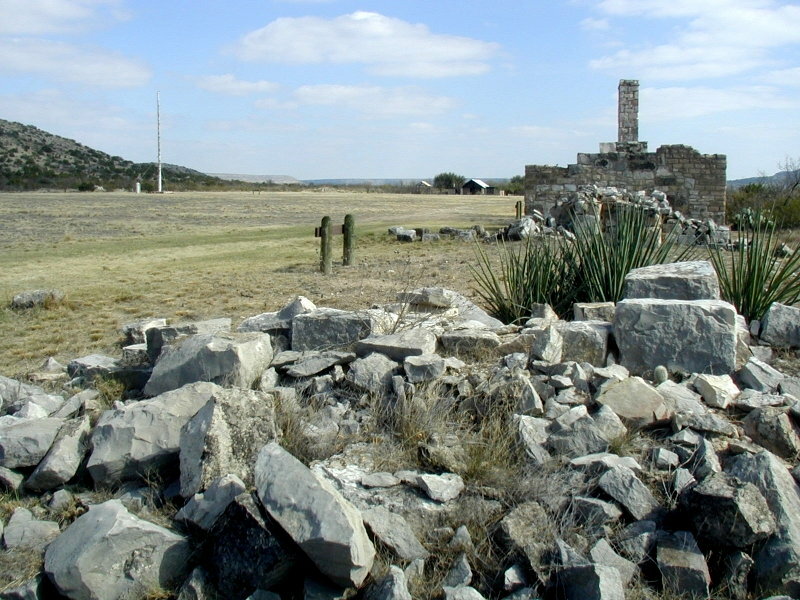 Fort Davis was a key post in the defense system of west Texas from 1854 until 1891. 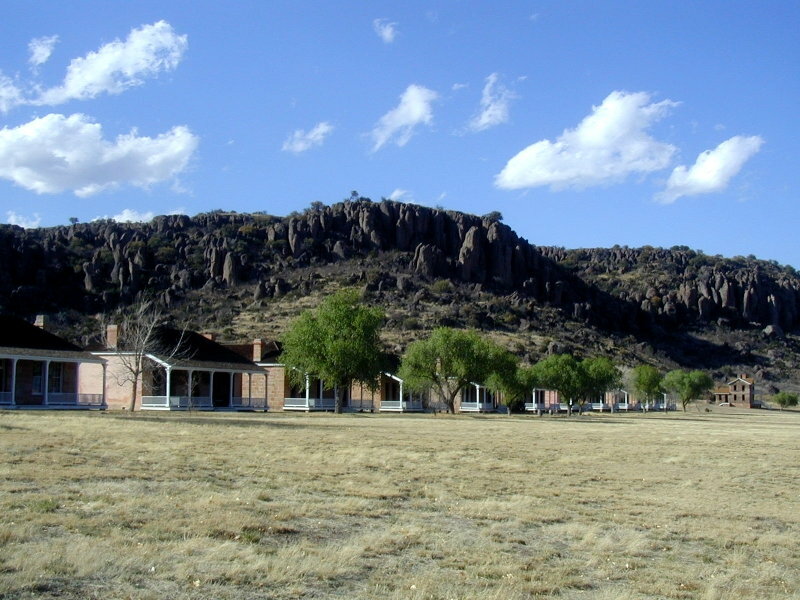 Fort Davis is one of the best remaining examples of a frontier military post. Afterwards, we drove around Fort Davis using the tour guide and viewed the historic buildings and houses. 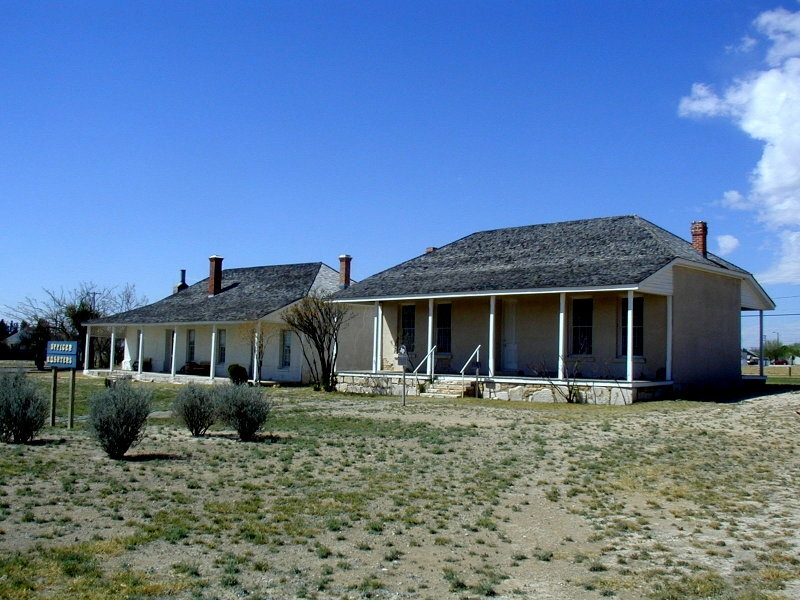 < Historic Fort Davis Officers housing. 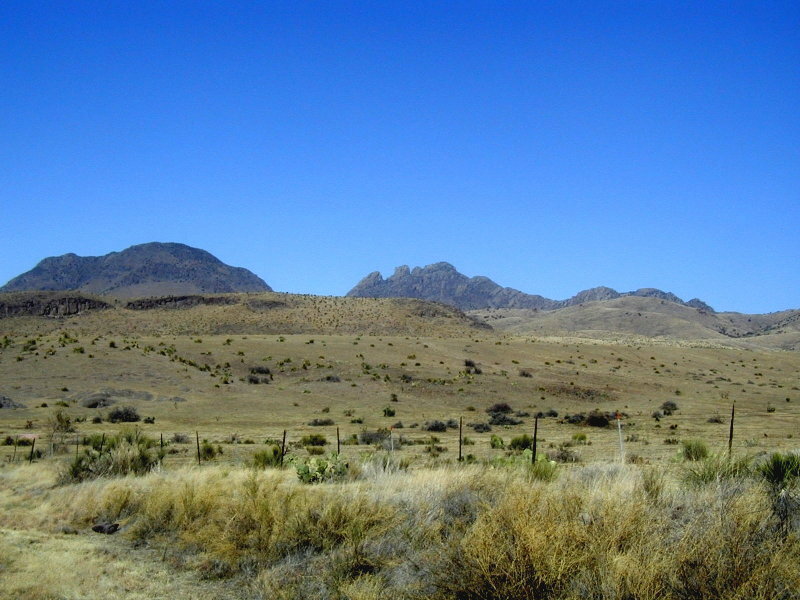 < The Davis Mountains from TX-166. Thursday, we started back on our long journey back to the Houston area. We bid farewell to Fort Davis and the Davis Mountains and drove up TX-17 to IH-10, then eastward to Ozona, TX. 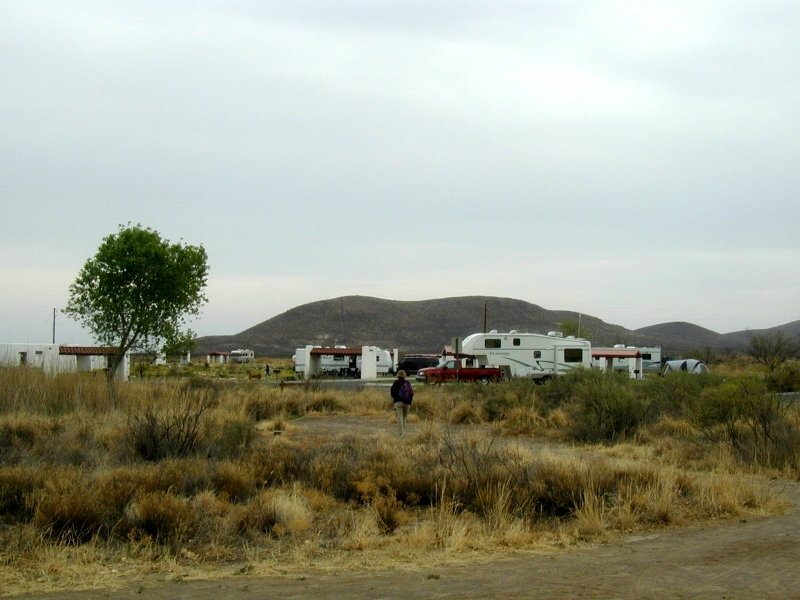 We arrived in the mid-afternoon at Circle Bar RV Park. 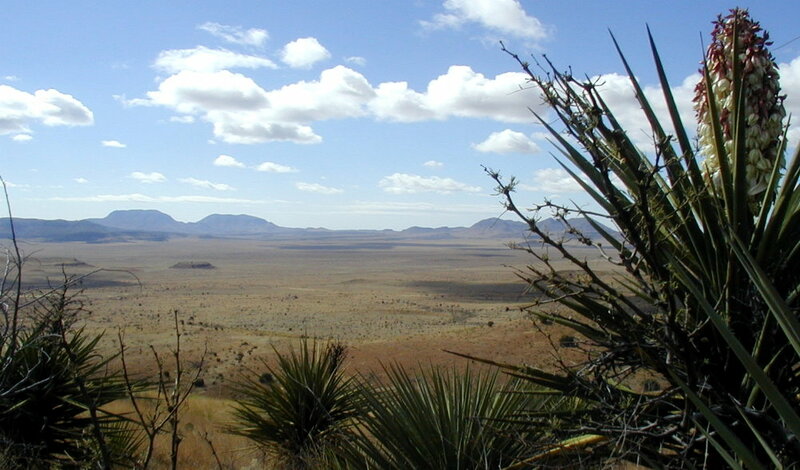 < A last look at the Davis Mountains from TX-17. Friday we continued east on IH-10, but detoured onto TX-290 at Sheffield, TX. East of Sheffield lie the old remains of Fort Lancaster at the Texas Parks and Wildlife's State Historical Park. There's not to much left now of the old fort - just some piles of stones from the old buildings. After a short visit, we continued east on IH-10 to Seguin, TX. We spent Friday night at River Shade RV Park, one of our favorite travel stops from Houston. It is a nice campground located on the banks of the Guadaloupe River. < Historic Fort Lancaster remains. Saturday we continued east on IH-10, arriving in Richmond by mid-afternoon. This draws to a close our Davis Mountains and West Texas RV Vacation. We hope you enjoyed the pictures and brief descriptions of our activities. God willing, join us again soon for another RV adventure.